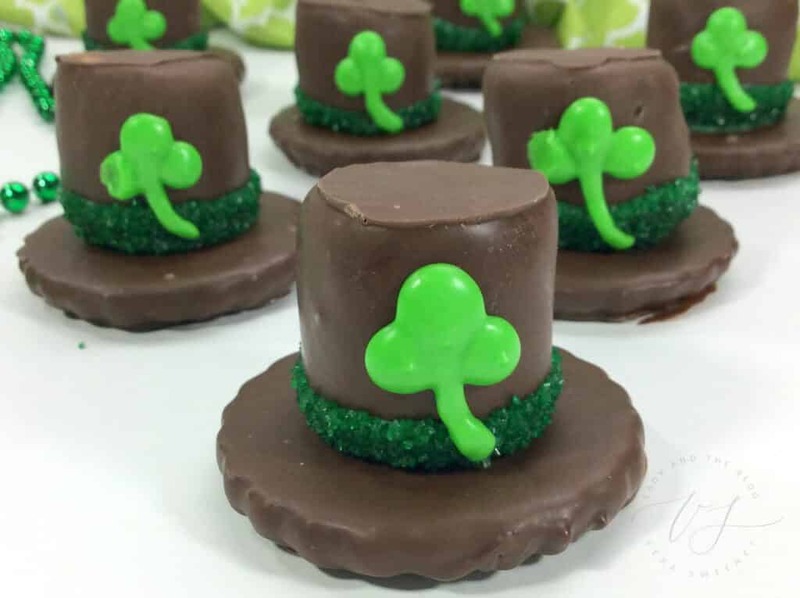 I have a really fun St. Patrick’s Day dessert idea for you and your family to enjoy! Especially if the little ones love leprechauns. 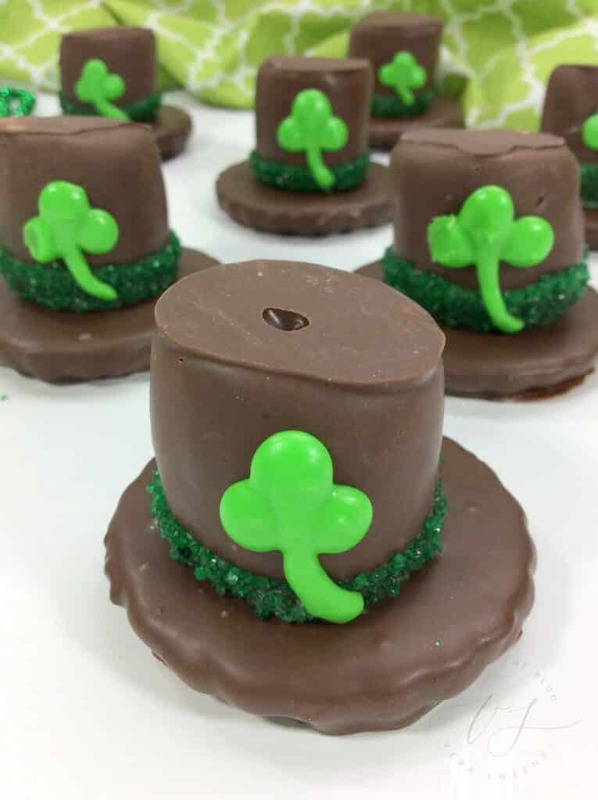 These Leprechaun hat treats have a marshmallow and chocolate base which means that everyone will love their tasty surprise. With just a little bit of time and luck, you can have these adorable snacks ready for your upcoming holiday get together. As a Sweeney, you know that we celebrate St. Patrick’s Day wearing green from head to toe! I’ve gone online to search out different types of St. Patrick’s Day desserts and I think Leprechaun hats certainly fit the bill. When I went to Ireland and took a tour, they showed me a rumored leprechaun house. Isn’t that funny? I have to find that photo and write a post about that adventure. It was naturally as tiny as can be, but it looked like a fortress or a castle. I actually enjoyed listening to my tour guide tell me a long tale about how that house came to be, who was rumored to live in it long ago and why the locals never set foot near it at night. LOL! No, seriously – I will find that photo for you. 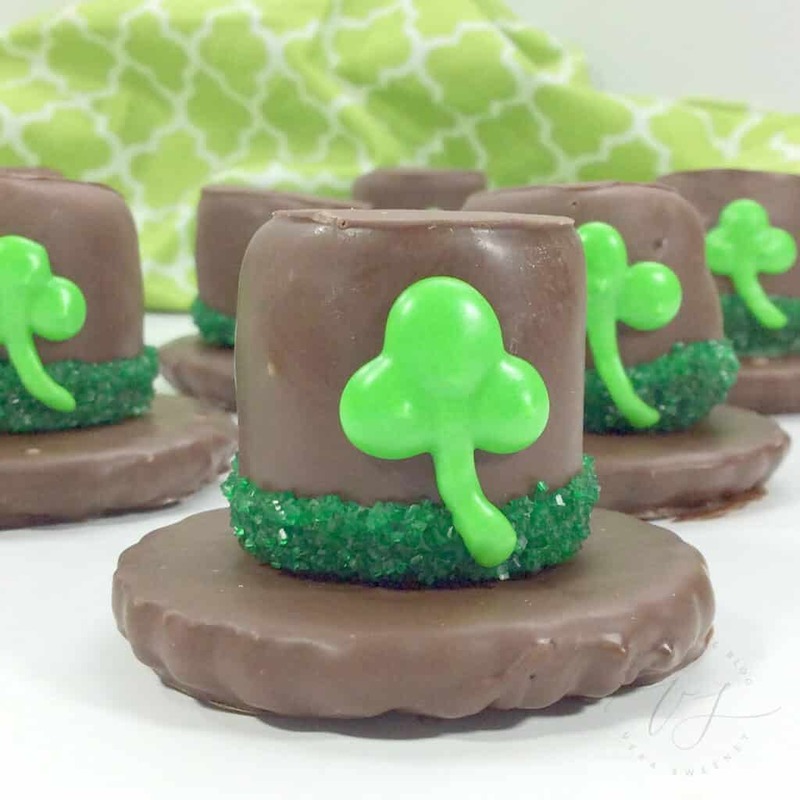 Onto the dessert – this St. Patrick’s Day dessert recipe will make 12-16 hats. Using a double boiler, melt the Ghirardelli melting chocolate and mix well with a rubber spatula until everything is smooth. Individually dip a striped cookie into the melted chocolate. 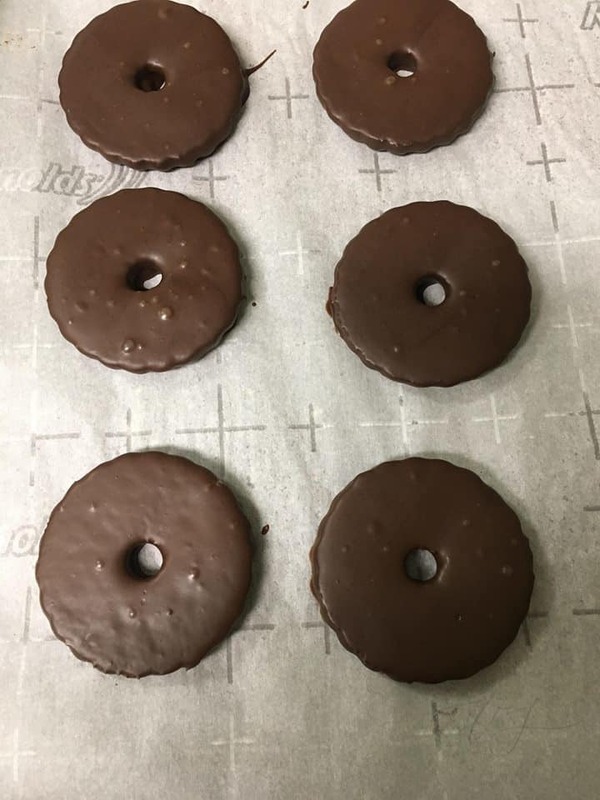 Using a fork, flip over the cookie so that it becomes completely coated. Carefully, pick up the cookie and lightly tap the edge of the pot. This will help you get rid of the excess chocolate. Place the cookie onto your the parchment paper. While those are drying, start dipping your marshmallows. Using the toothpicks, poke a toothpick into a marshmallow. This will be used to hold your marshmallow and it will allow you to easily dip it. 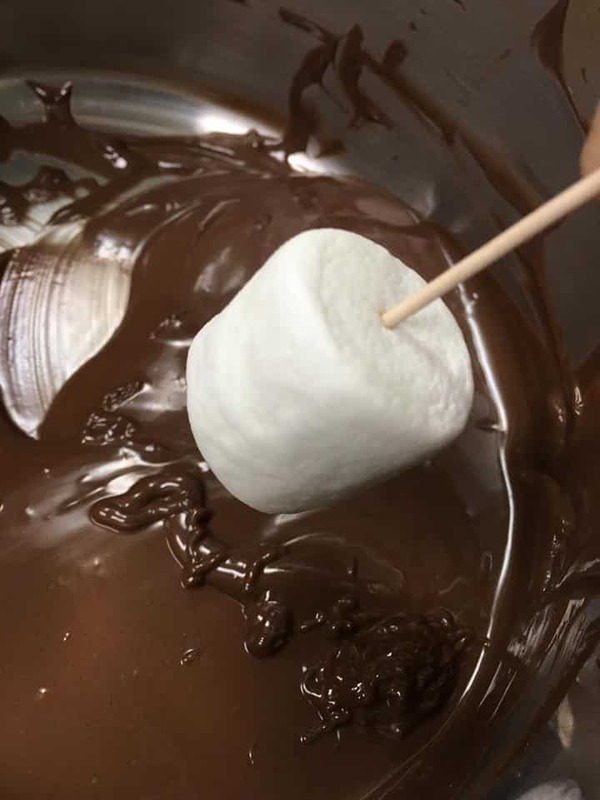 Dip the marshmallow almost fully into the chocolate. You will still want to see a little of the marshmallow where the toothpick is because you will dip this side in green. Once all the marshmallows have been dipped let them sit on the cookie sheet to completely harden. 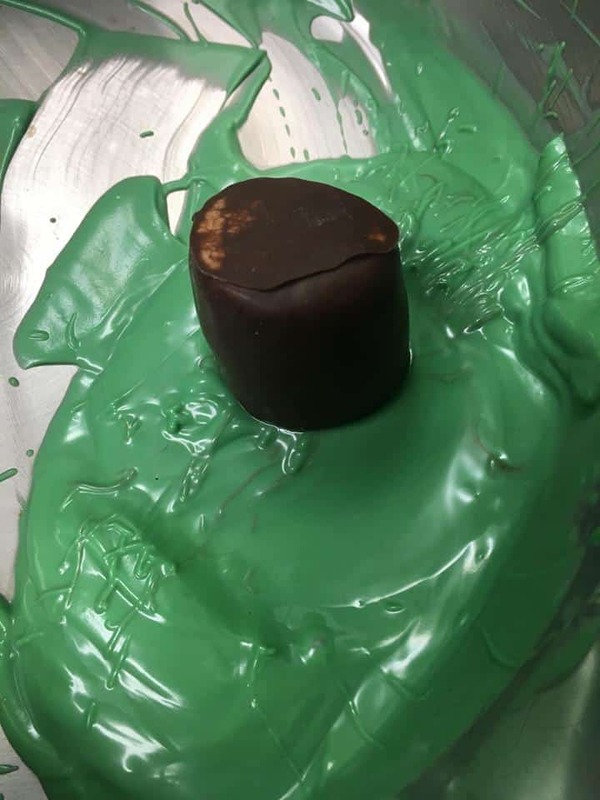 While the marshmallows are hardening, clean out your double boiler so that you can start to melt the green candy melts. Once the double boiler is clean and dried, start to melt the candy melts. When the candy melts are partially melted, mix in the coconut oil. This will thin out the candy melts so that it becomes smoother. Pour the green sanding sugar in a small bowl. When your marshmallows have completely hardened, carefully remove the toothpick. Dip the bottom into the green candy melt Carefully shake the marshmallow to get rid of excess candy melt. Scoop some of the green candy melt into the piping bag and set aside. Let the ‘hats’ dry for an hour so that the candy melt can harden. Once all the marshmallows have been dipped let them sit on the cookie sheet to completely harden. When the candy melts are partially melted, mix in the coconut oil. This will thin out the candy melts so that it becomes smooth. Carefully shake the marshmallow to get rid of excess candy melt. Let the chocolate harden for 30 minutes before enjoying! Just in case you want to tell your kids a few fun facts about leprechauns, here you go. Leprechauns like to live alone and spend their days making and mending shoes. They are known for having a hidden pot of gold at the end of the rainbow. Leprechauns like to drink dandelion tea. Leprechauns average about three feet in height according to Irish folklore. A leprechauns most well-known weakness is a four-leaf clover.